and sought-after brands in the industry – Benjamin Moore, Davis, Glidden, Flood, Cabot, Sikkens, Modern Masters and more. Benjamin Moore is our flagship product line offering a full assortment of excellent coatings; from dependable economy-priced builder grades to ultra-premium decorator finishes. Utilizing advanced color-look technology for ultimate color retention, these products offer superb durability and performance. With over 3500 beautiful colors to select from, Ben Moore offers the largest paint palette available in the industry. Davis Paint was founded in 1938 by James T. Davis in Lynchburg, VA. Their paints and stains provide superior quality and great value for homeowners and contractors. Davis offers paint lines that utilize the power of Microban technology, which is safe, effective and durable antimicrobial product protection that inhibits the growth of bacteria, mold and mildew that can cause stains and odors on the dried paint film. We also stock Glidden paints which have always been a popular and trusted line with both contractors and do-it-yourselfers alike. At Capps, we offer an extensive variety of premium exterior deck and siding stains from all the top rated names on the market. Flood, Cabot, Sikkens, and Davis, as well as Benjamin Moore’s premium Arborcoat label are names our customers have come to trust and depend on. Modern Masters is Capps’ decorative paint line, designed to help bring out the artist in you. We carry everything from glazes and metallics to textured coatings and Venetian plaster. Visit our in-store display of samples for a just a few ideas of how you can create unique wall coatings for your home or business. In addition to the best products we also offer the most knowledgeable and dedicated paint staff in the area. 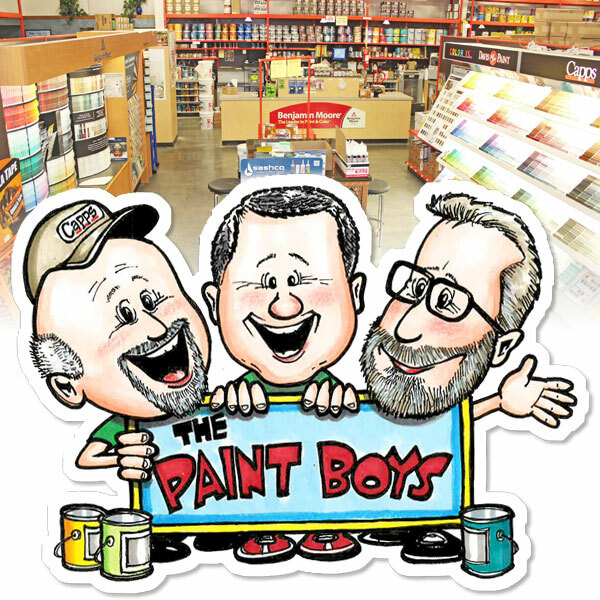 Together, The Paint Boys have more than 50 combined years of experience. We’ve heard it all and can answer any question customers may have. We also have an on staff artist, Jim Ashton, who is happy to help customers plan and bring their decorative painting projects to fruition. Finally, for a list of professional painters in the Smith Mountain Lake area, speak to one of our paint experts.